Measure 4 cups of water in a liquid measuring cup and pour into a medium saucepan. ** Grown-up step ** bring water a boil. Once water is to a boil, measure 2 cups of frozen edamame. Kid chef, set the timer for 5 minutes. Take one clove of garlic and remove the skin. A head of garlic contains segments that are called cloves. You will need 2 cloves from one garlic head. Below is a picture of a garlic head. Below is a picture of 2 cloves of garlic. You can use a can to smash down on the garlic cloves! 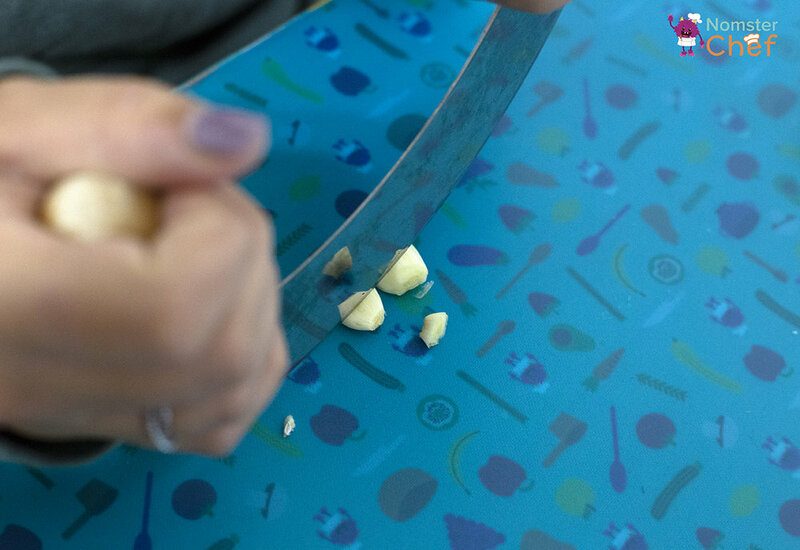 This will make garlic cloves easier to peel! Using the mezzaluna knife, mince the garlic into smaller pieces. To mince means to to cut up into very small pieces. (If you don’t have a mezzaluna knife, you can use a garlic press). Start mincing from the top of the garlic clove. Once you have made it all the way to the bottom, rotate the knife 90 degrees and mince again. Cut a lemon in half using the kid chef knife. Squeeze ¼ cup of lemon juice into a liquid measuring cup. Set aside the minced garlic and lemon juice. ** Grown-up ** Once the timer goes off, drain the edamame from the pot and pour into blender. Add lemon juice and minced garlic. Add ¼ teaspoon of paprika. 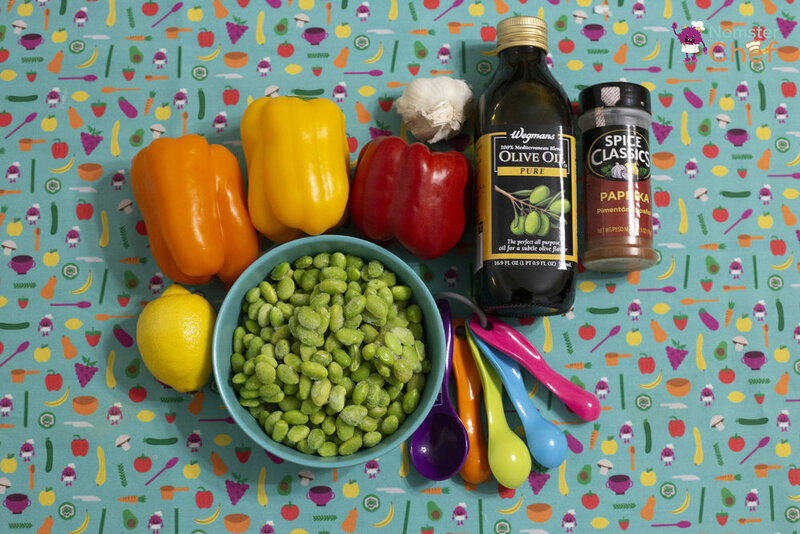 Add 3 Tablespoons of olive oil and 3 Tablespoons of water. Put the lid on the blender. 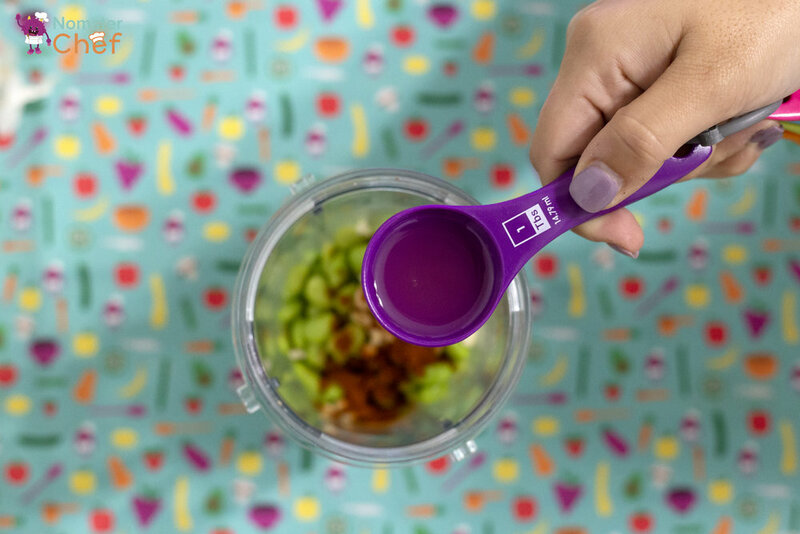 Pulse the ingredients until smooth. Once the ingredients are pulsed, use your kid chef knife and cutting board to cut the pepper into thin slices. ** Grown-up ** Scrape the edamame dip from the blender into a bowl. A mezzeluna knife is the perfect inexpensive knife for when your kid chef is ready for a sharper knife but not quite ready for a chef’s knife. Grown-up, you can also buy fresh edamame that requires shelling.